This wedding (and I mean this when I say it) was the definition of class. With a great vendor team led by Kara Superfine, beautiful photographs by Averyhouse, and a gorgeous venue that is the Hinsdale Golf Club, how could you possibly go wrong? You never know what October is going to bring you. Some days are cool and rainy and other days, like this one, are full of sunshine and a crisp breeze. Kristin & Phil really lucked out with the perfect autumn day and we felt honored to play a roll in making their day so stunning. From the loose and organic bouquets to the oversized ceremony arrangements, every piece flowed together seamlessly. A lot of that credit goes to Kara Superfine whose attention to detail is off the charts perfect. In addition to the ceremony urn arrangements, we created wreaths that welcomed the guests into the church as well as a number of gorgeous pew accents. Usually from a decor perspective, cocktail hour takes a back seat to the rest of the day’s events, but not with this wedding. Two stunning arrangements welcomed guests into a tent on the great lawn just outside of the Golf Club. Inside of the tent, lanterns with accents of magnolia leaves and olive sprigs adorned the highboy tables and cabarets while Cafe Lights were stung above. Inside of the ballroom, the long head table was draped in a garland that we made out of Magnolia, Eucalyptus, Bay Leaf, Olive, Snowberry, Dahlias, and Spray Roses. Candles were the name of the game as they adorned the head table and fireplace mantles, creating a romantic glow throughout the room. 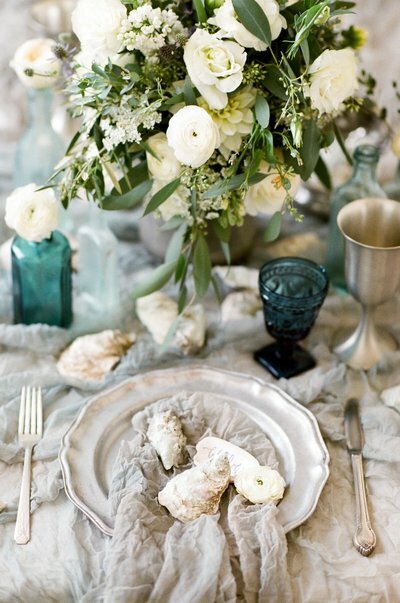 The second style consisted of mercury glass pillar candle holders and a collection of mercury glass vases hosting a consistent floral recipe. We worked with Kara Superfine to finish off the tables with ivory yuma linens and gold-rimmed chargers. The final result was nothing short of magnificent. Congratulations to Kristin & Phil, we wish you a lifetime full of happiness together!